Hololens seemed pretty spectacular when it was announced back in 2015. It was a proper augmented reality headset, with holograms, the likes of which we hadn't seen before. Of course in the time since we discovered it wasn't quite as spectacular as we might have thought. The headsets were very impressive, but they had a lot of shortcomings. Shortcomings like the limited field of view, and the fact they were fairly heavy and somewhat uncomfortable as a result. Well today Microsoft took to the stage at MWC to finally unveil the second generation Hololens people have been speculating about for the past four years. Not only is it lighter and more comfortable than its predecessor, it also promises to be a whole lot smarter than before. Oh, and the field of view has been doubled, so you don't have to peer through tiny little letter boxes to see what's going on around you. But don't expect to be going out to buy one anytime soon. The main thing to note about Hololens 2 is that it has a brand new display. What Microsoft referred to as the 'world's smallest and post powerful' 2K MEMS display, with a field of view that promises to be twice the size of the original Hololens headset. Microsoft didn't give us any exact figures, but claims it's like swapping out a 720p TV for one with 2K resolution. That's a big jump, and hopefully the final headset shows that. Other big advancements here includes a new 'time of flight' depth sensor, which lets the headset track hands and individual fingers without needing controllers or any other sensors. You know, the kind of thing you wish you had in VR gaming. 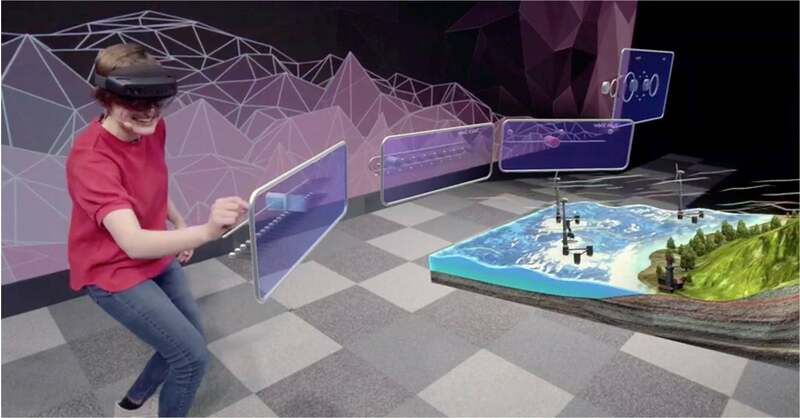 To demonstrate that Microsoft pulled up an employee to play with buttons, dials, and even a full-size piano in Hololens 2's holographic playground area. It also comes with eye-tracking, which allows for that extra degree of control, with iris scanners that are connected to the Windows Hello biometric authentication system. As for the headset itself, it's been redesigned for the comfort factor, using a mix of plastic and carbon fibre components in a way that allegedly makes it feel like it's "floating on your head". The visor has been redesigned to flip up quickly, almost like a welder's mask, to quickly pull you out of AR and back into the real world. That's a big improvement from the rotating headband of the original. There's also a dial at the back to make sure it fits your head, much like you would find on the PSVR or other virtual reality headsets. And Microsoft will be making Hololens 2 an open platform, as confirmed by Epic Games head Tim Sweeney. So that means it won't be limited to Microsoft's app store or software. Developers will be able to produce their own marketplaces, and you won't be forced to use Edge. Firefox has already signed up, and hopefully Google and the rest will in the near future. In fact, Spatial showed off a piece of software called Spatial Anchor that was able to connect to Apple's ARKit and Google's ARCore, meaning Hololens users will have the option to work across platforms - assuming developers offer that functionality in their software. The downside here is that Hololens 2 is still not a consumer-ready product. All the hardware and software upgrades mean anyone who wants pone will still be forced to cough up $3,500 (£2,778), or take out a financing deal that costs a minimum of $125 a month. It will also be coming to various markets, including the UK and Ireland. In fact a huge chunk of the announcement presentation was dedicated to enterprise-centric case studies, showing how Hololens has changed the workplace and what Hololens 2 is going to do to improve that. But nowhere was this more true that the holographic 'meeting room' shown off my Anand Agarawala, co-founder and CEO of Spatial. While similar in functionality to something like Oculus Rooms, the focus of the space was very much work-oriented, and not the kind of place you'd beam into to watch a film with your friends. But enterprise users are the ones who can spend the money implementing AR tech into their existing work, so it makes sense that Microsoft would still be actively courting those users to its platforms. It even announced a new customisation service that would adapt Hololens 2 headsets for specific use-cases, using a headset/hard hat combination as an example. So yeah, this is not for you. There's potential for consumers to get a lot out of Hololens 2, as was shown by the initial Minecraft demos at the original's launch event, still but the obvious problem is a lack of things to do. Here's hoping the improvements mean developers can start adopting the tech, even if it's just getting Epic Games to roll out another variant of Fortnite.